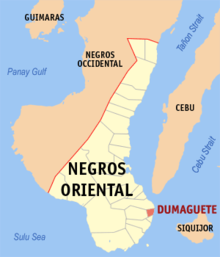 Negros Oriental is a province occupying the south-eastern part of Negros, and also includes Apo Island. The other part of Negros is the province of Negros Occidental. 9.310278123.3080561 Dumaguete - capital and largest city. Most of these are on the coastal highway that rings the island. Pamplona and Mabinay are up in the mountains, reached via other roads. The main language of the region is Cebuano. See the Dumaguete article for the main routes into the province. One of the best diving spots in the Philippines is Apo Island, off the coast of Negros Oriental, near Dumaguete. This region travel guide to Negros Oriental is an outline and may need more content. It has a template, but there is not enough information present. If there are Cities and Other destinations listed, they may not all be at usable status or there may not be a valid regional structure and a "Get in" section describing all of the typical ways to get here. Please plunge forward and help it grow!